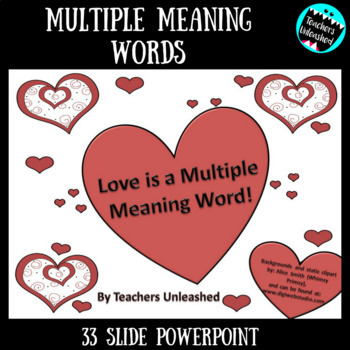 Fall in love with multiple meaning words with this 33 slide presentation. 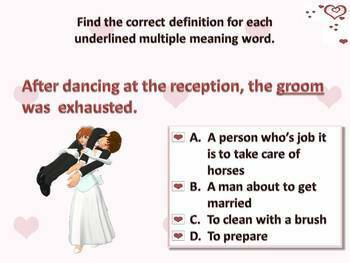 Students will be introduced to what multiple meaning words (m.m.w) are, taught about deciding whether m.m.w. is used as a noun or verb, then asked to show their understanding using their whiteboards or pencil and paper. 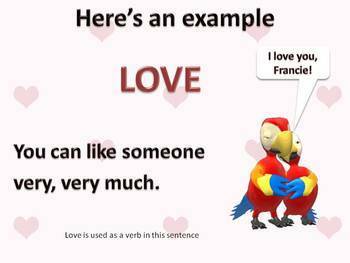 Presentation will then introduce homographs (same spelling, differing pronunciations)and guide them through many examples. Finally, mastery will be tested through 10 test prep type questions (using commonly used testing stems. Presentation is loosely themed towards Valentine's Day, yet generic enough for any day use. 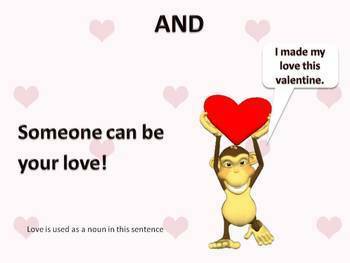 Expect your students to get a thorough workout with multiple meaning words with this presentation!! !